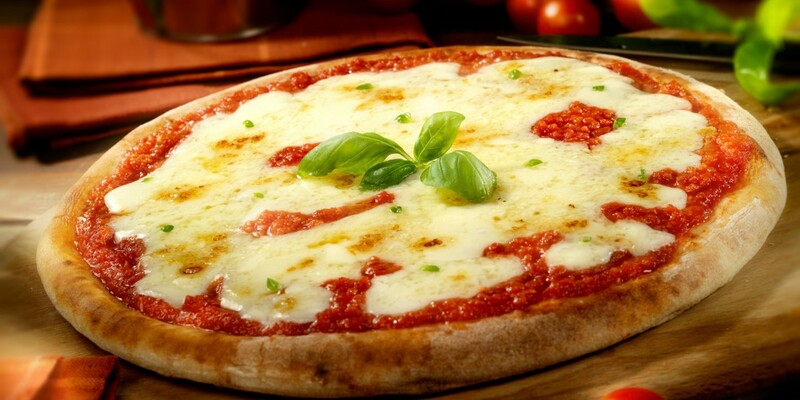 To make a Pizza Margherita, start with the dough. Pour water into a bowl, add salt and dissolve with a large spoon, then add the oil and amalgamate everything. In another large bowl, sift the flour, mix together the brewer’s yeast and sugar. Pour part of the salted water-olive oil mixture into the centre of the flour and begin kneading with your hands or a fork. Keep within reach some flour and warm water; mix it gradually into the dough until achieving the desired consistency, which should be smooth and elastic (depending on flour type, you will use more or less water). Continue kneading until you get a smooth, soft, consistent dough. Now form a ball, then take a large bowl (remember that the dough will double in size), generously sprinkle flour on the bottom, and put in the ball of dough. Cover the bowl with transparent food film, and put in a warm place away from air currents, such as an oven with the heat off but the light on. Wait for the dough to double in volume–about a couple of hours. Meanwhile, grease two baking pans 33cm in diameter. Take out the dough, which is now leavened, and take half of it; re-cover the remainder with film. Roll out the dough to form a ca. 34cm circle, and put onto the baking pan. Do the same with the other half of the dough. Put into a small bowl the tomato purée, a bit of olive oil and salt, and use a spoon to spread the tomato sauce over the pizza. Preheat the oven to 250°C, put in the pizzas for 6-7 minutes (or in a convection oven at 220°C for 5 minutes). In the meantime, completely drain the fiordilatte, cut into slices, remove the pizzas from the oven, distribute the fiordilatte over the surfaces, and bake again for 6-7 minutes. When finished, remove the Pizza Margherita, and serve immediately on a serving platter, garnished with a few leaves of basil.